Over our two week walk Disney World holiday we ended up spending three and a half days in total at Magic Kingdom, by far longer than we spent at any other park. Being the original park and in many ways the most iconic with the Cinderella Castle, I felt like I really wanted us to go there for our first full day on holiday for it to be extra special and we spent another day there for my birthday. 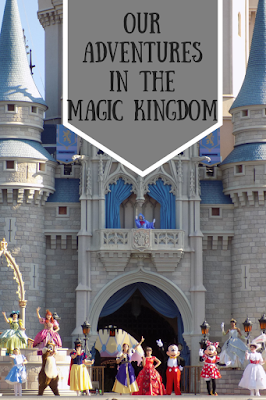 I planned a half day visit for my behind the scenes 'Keys to the Kingdom' tour and I had expected the kids to want to have a pool day but instead they chose to come to Magic Kingdom too to complete their favourite game of Sorcerers of the Magic Kingdom. Finally, we spent the full day of Mickeys Not So Scary Halloween Party there too, a great end to our holiday. The Magic Kingdom is divided into four 'lands'- Adventureland, Frontierland, Fantasyland and Tomorrowland. All these area have their own distinct identity from the buildings to the design on the paths from the cracks to the horse shoe prints, I think this is what makes Disney a step above other themes parks with their theming, the imagineers have thought of everything. Even within the lands there were distinct areas, I loved the carnival style of the Storybook Circus area in Fantasyland. Everything was close enough with the castle as the hub to allow us to move back and to between the areas as needed to get to our fastpasses. On the first morning after we arrived in Orlando we got the bus to Magic Kingdom from our hotel, Disney's Port Orleans French Quarter. We were up early as we still hadn't really adjusted to the time difference and we found we had plenty of time. We had breakfast at Be Our Guest booked for 8.15 so we entered the park early, before park opening and it was magical to be able to be in the park before the crowds. After our breakfast the park was only just opening up so we were quickly aboard our very first ride on the first day was the Winnie the Pooh ride, this gentle ride through scenes from the book with some added Tigger bouncing immediately became one of my son's favourites. We then squeezed in a quick ride on the teacups, always a winner and had photos taken by the castle before our first fast pass, The Jungle Cruise which is a lot of fun. We enjoyed going Under the Sea, riding in shells through scenes from the Little Mermaid. We then rode The Haunted Mansion and also waited about 20 minutes to meet Tinkerbell in the theatre at Town Square. We then headed back to Fantasyland to ride the small The Great Goofini's Barnstormer roller coaster back over in Storybook Circus. It wasn't a good sign that my son was scared on this, I knew then that we would have to do a lot of baby swaps on the trip! We were all ready for our fastpass on Splash Mountain to then find the ride was closed so we hopped over to Tom Sawyer Island on the boat and loved exploring the buildings, bridges and caves and playing Checkers! A very surreal start to the holiday! This was a great place to take photos including of the beautiful Florida wildlife including the beautiful birds and big colourful butterflies. After lunch at the Mexican themed Peco Bill's we spent some time in the company of the music of the 'Country Bears'. The vintage shows at Disney World with their animatronic people and creatures were some of the kids' favourites. We also did our first 'baby swap' for Splash Mountain, my son's loss was definitely my daughter's gain as she got to ride many of the bigger rides twice, once with each of us. Having a hug with Live Lips McGrowl- perfect! Other attractions that day included visiting the singing birds in the Enchanted Tiki Room before heading over to Tomorrowland for 'Carousel of Progress' which turned out to be very popular with the kids, over the holiday we went on three times. We then caught some of the Incredible Summer with Edna Mode and Frozone plus themed PhotoPass opportunities. It started to spit as we went on the People Mover and it was fun to watch everyone else in the rain whilst we were on the largely sheltered ride. As soon as we came off we had our first occasion to get the ponchos on for our first Florida storm. It began to ease after 20 minutes so we headed over to Mike's Laugh Floor which was the perfect way to shelter from the rain with this interactive animated show. We left the park in the early evening so that we could return to the hotel and the kids could enjoy the 'Glow with the Flow' pool party. Our second day at Magic Kingdom was a week into our holiday and was my-gulp- 40th Birthday. It was also International PhotoPass Day at the Disney Parks and I was expecting it to be very busy so I was amazed at how quiet it seemed. It was very hot which meant we didn't necessarily want to dwell too much outside but we were able to see a lot that we had missed on the first visit. We had Photopass Day pictures taken and I was pleased during the day to get a photo by the purple wall. 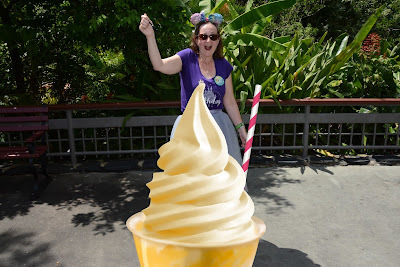 I also had my first Dole Whip float- it was the orange rather than pineapple one and very delicious! Not quite as big as the one in the Photopass Day picture! When we arrived that morning we caught the 'Let The Magic Begin' welcome show with Mickey and Minnie on the Castle Stage which was fun and I loved the Fairy Godmother popping out of the window. Whilst Keith and our daughter started the day on Space Mountain, my son and I started the day on It's A Small World, and as there were no boats ahead of us I loved looking at the reflections on the ride made in the water. The magic bands come into their own at the end when magically our names were displayed on the board as we left the ride, We rode Seven Dwarfs Mine Train for the first time which was good fun as well as Pirates of the Caribbean which I think I prefer in Paris! Two drops are better than one! Despite the tent around the outside we enjoyed a ride on the Carousel. Unfortunately my son fell over afterwards but luckily he was soon seen by the 'Royal Majesty Makers', characters who roam around Fantasyland. Sir Sterling, Knight Extraordinaire, came to his aid and soon made him smile again! We also caught a few of the shows we had missed previously including the Move and Shake it! Dance and Play it! 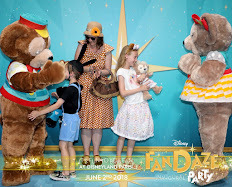 Dance Party which I was so impressed with how the characters interacted with the guests and the guests with the characters- no pushing and barging just lots of fun and dancing! I also caught Mickey's Royal Friendship Faire and the Festival of Fantasy Parade for the second time and I could tell how quiet the park was by the amount of space around us for the parade- I've never experienced such a small crowd before! We enjoyed watching the Muppets in Liberty Square and braved the Hall of Presidents. I particularly enjoyed our visit to Belle's Enchanted Tales as Keith was chosen to be a guard so he and the kids all took part in the show! Very funny!This is a great photo opportunity with Belle and a PhotoPass photographer took some great shots. I have to confess to being a bit underwhelmed by the 3d Mickey's Philharmagic so I am hoping that I eventually fall in love with it when it opens at Disneyland Paris. As we went up and down Main Street we often caught the Main Street Trolley Show and one day we saw the Flag Retreat ceremony. Of course the day wouldn't have been complete without another trip on the Carousel of Progress which by now the kids would confidently sing along to! It's a great big beautiful tomorrow...!We also went on Buzz Lightyear's Space Ranger Spin which is similar the the Disneyland Paris' Buzz Lightyear Laser Blast ride but perhaps feeling its age a bit more but still a lot of fun. When the rain finally came we were heading in to Cinderella's Castle for my special dinner at Cinderella's Royal Table. This was a meal we booked on our dining plan and it was a highlight for me- seeing the inside of the castle, fun interactions with the princesses, great food and champagne, a fantastically funny and attentive cast member waiting our table- thanks Christopher! My daughter had a magic wand, my son a sword and both were given wishing stars- I was also given a magic wand like the kids for being a birthday girl and a birthday cupcake at the end of the meal- a perfect night! The kids returned to the hotel with Keith for a swim but thankfully the storm cleared so that I could stay and watch the Happily Ever After Fireworks followed by Once Upon a Time- this was an unexpected treat as Once Upon A Time reminded me of all the best bits of the old Disney Dreams show from Disneyland Paris with the beautiful stories projected onto the castle, making the most of the castle architecture. Our third visit to Magic Kingdom was a few days later when I went on the Keys to the Kingdom behind the scenes tour. This five hour tour was just fantastic and I found our tour guide, Melody, very engaging as she talked about Disney history, the history of Magic Kingdom and her own journey to working at Walt Disney World. My tour included a trip aboard the Jungle Cruise with Melody giving an alternate 'behind the scenes' commentary and an extra visit to the Haunted Mansion with a definitely not planned 20 minute pause in the Madame Leota scene! The biggest thrill for me was seeing what was actually a load of very perfunctory but essentials corridors under the park, the Utilidor. This tour really is something worth doing for anyone fascinated by the workings of the parks. The tour is for over 18s only and I loved having a morning with adult company and chat over our lunch at Peco Bills. I thought the kids would choose to spend the day by the pool with Keith but instead they chose to also have an extra day at Magic Kingdom in order to focus on their favourite holiday past time, playing Sorcerers of the Magic Kingdom. 'Santa' had brought them some Sorcerers cards in their stockings before the trip (good old eBay) and they had them in collectors albums so they loved going to the Fire Station on Main Street everyday to collect more cards and swap doubles with the cast member. The game was simple, they followed the map to find the portals and chose the cards to use to put a spell on the villains. Our final day at Magic Kingdom was a couple of days before we were due to fly home. 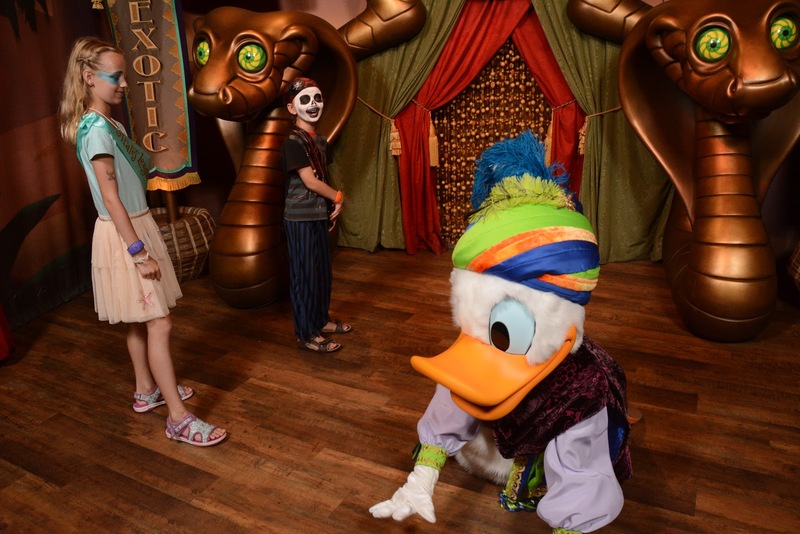 Yes it was late August but yes we did have tickets to Mickey's Not So Scary Halloween Party that night! This was our only chance to go to the party so I took it! The day itself was an opportunity to do any rides we had missed and ride again on any favourites. We finally went on the Tomorrowland Speedway ride with a fastpass as it always had long queues. It was fun but I thought the track wasn't as fun as Paris' Autopia, no interesting scenery and theming which was disappointing. The kids also went to the Pirates League for a make over, my daughter chose the mermaid make over and my son had a pirate zombie makeover. Both were great fun in a fully themed area with a little hunt at the end for their necklace/medallion. I was disappointed that a PhotoPass photographer wasn't there so glad that we went straight in to our fastpass with The Little Mermaid. We wanted to ride Dumbo but rain in the afternoon prevented it but we did manage to try out the Dumbo softplay which is where guests wait for their turn on the ride, a great idea! 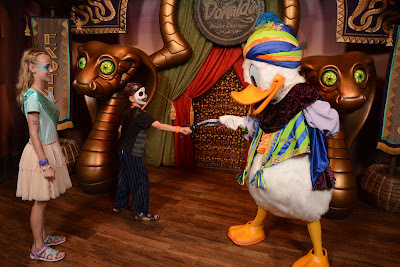 The prolonged storm meant we queued to meet the fabulous carnival themed Minnie, Daisy, Goofy and Donald instead and the interaction my son had in his pirate costume with Donald was priceless. We squeezed in another fantastic hunt of A Pirates Adventure where we followed a map tp find fun interactive elements around Adventureland. Between the rain clouds and of course, managed a final trip around Carousel of Progress. We didn't have too much time to dwell on the Disney Blues as our day ended with the Halloween party. 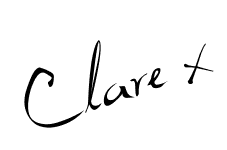 I will do a separate blog post about this, it was fun but busier than I expected. My son and I met Lotso, my daughter and husband chose to ride Space Mountain in the dark instead- very brave! We all rode Pirates of the Caribbean and spotted the live actor. 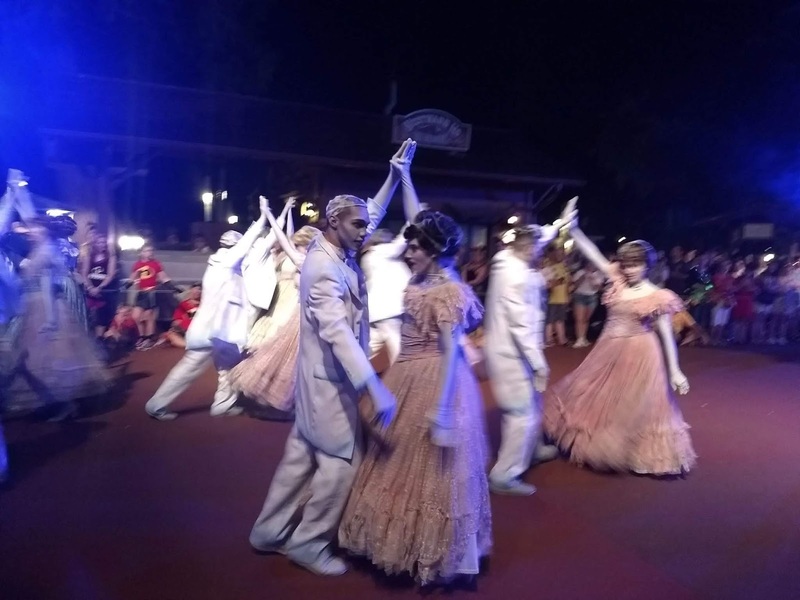 The parade was amazing and I loved the Hocus Pocus show which I stayed for towards the end of the evening when it was much quieter, the kids having returned to the hotel having enjoyed a final fun packed day at Magic Kingdom. Reflecting now on what we achieved, we really enjoyed multiple visits to the park. It was hot so we didn't want to rush and it meant we could fastpass different rides each day. 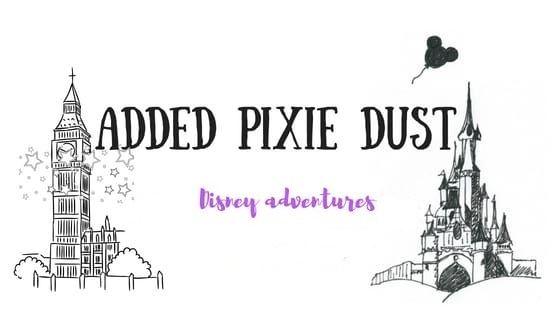 We rode favourite rides more than once and did every attraction in the park by the end of the holiday except Peter Pan's Flight, we have done it plenty of times in Paris and so it never felt like it justified a place as a precious fastpass or the alternative long wait. We didn't do all the meet and greets as the kids are a bit picky about who they meet these days and we met many characters during our character meals. We also didn't really spend much time in any of the shops at Magic Kingdom, I bought a pin, a couple more on Halloween and a pretty orange bird vintage style necklace but there was just so much else to do. My daughter told me this was her favourite Disney park and by the end we all certainly felt very much at home there! I have loved writing this and reliving our holiday memories. Have you been to the Magic Kingdom or is it on your wish list? 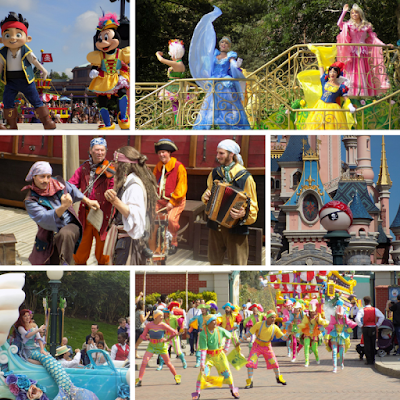 What are your favourite rides and attractions?